It’s time for one of our monthly Newsletters. This one is published during the current heatwave. 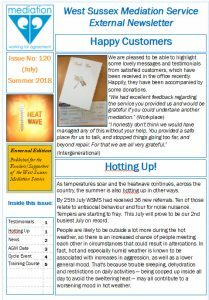 In this edition you will hear about our September AGM, how referral numbers are hotting up alongside the heatwave, an introduction to our new Civil Mediation leaflet and more.